There are two things you need to know about Gold Coast Australia. First off it is one of the most beautiful places on the planet. 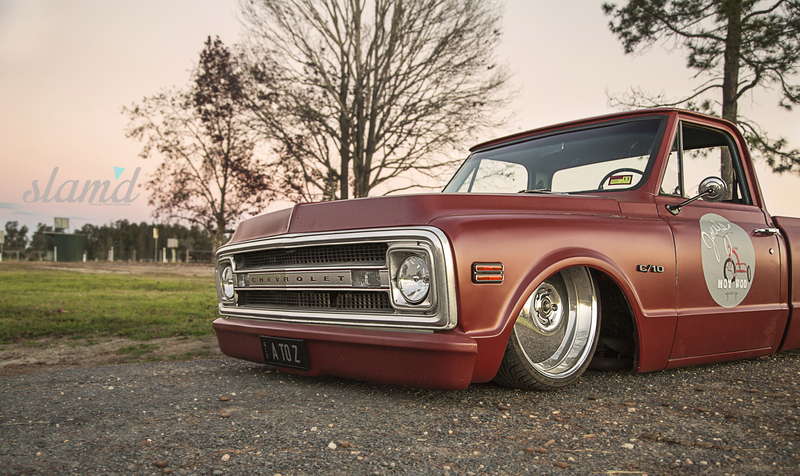 Second, Dave Russell hails from there and has built one wicked Forbidden C-10. Not only is Dave in Forbidden Fantasy but he represents the custom truck scene to the fullest in his super clean 1969 Chevy C-10. 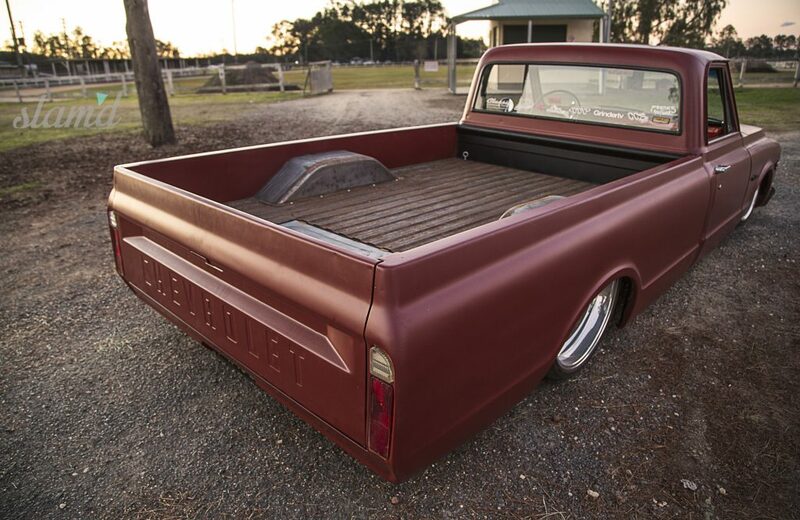 A truck such as this might not be that big of deal here in So Cal, but half way around the world, this C-10 turns heads everywhere it goes Down Under. When Dave first picked up this bitchin’ beauty it was a mere $6,000. 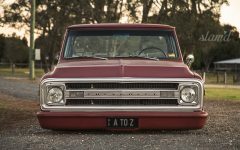 Living in Australia it isn’t as easy to scoop up a project truck, much less parts for these trucks. 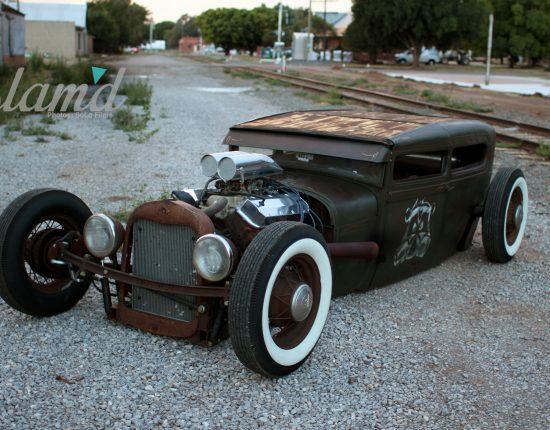 Staying motivated for those weeks at a time waiting on parts wasn’t all that easy at times, but Dave stuck it out, and as you can see has built one worthy cruiser. 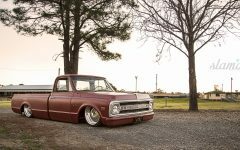 The foundation of the build began by tearing the truck down completely to the bare frame. 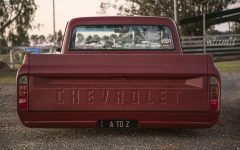 A new rear clip with a custom triangulated four-link and ‘bag on bar setup keeps the truck cruising straight down the streets of Gold Coast. The rear frame was boxed in for a solid and clean look and Dodge Ram rear shocks were bolted up to ensure a smooth ride. Up front, a Porterbuilt drop member was used in conjunction with a Mustang II rack and pinion steering setup, CPP drop spindles, Michigan Metal Works upper and lower control arms and CPP shocks. 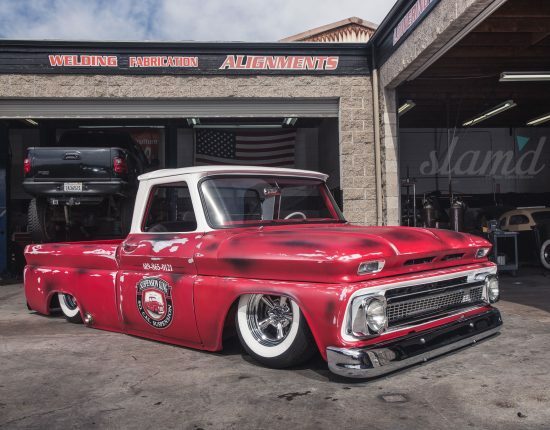 Slam Specialties RE 7s were used up front and RE 8s out back with Viair 380 compressors to top off the setup and help keep things running smooth. 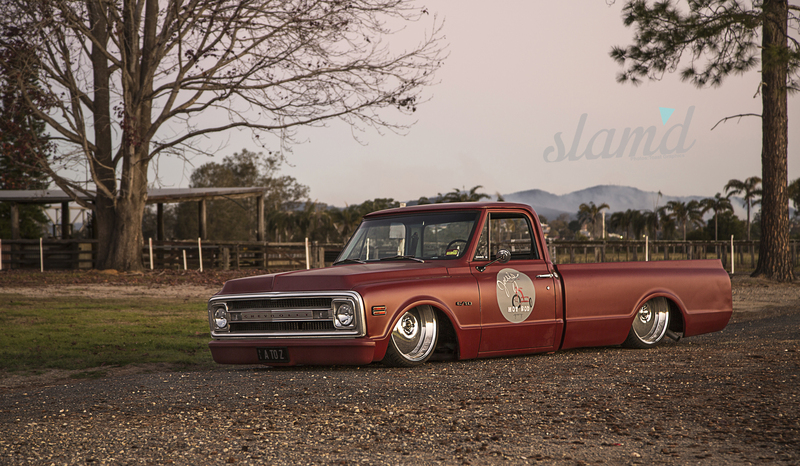 After taking the truck to Central Coast Showdown, Dave and his buds proceed to tear it back down for some more work. 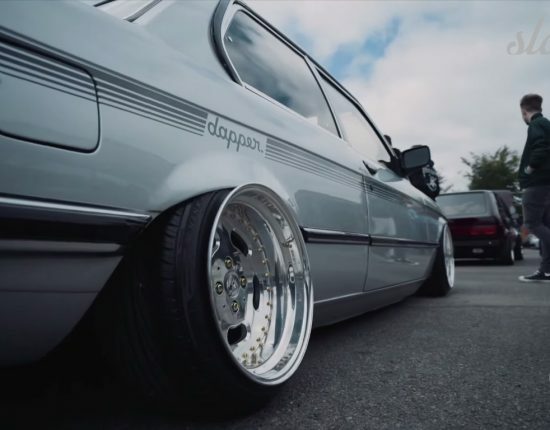 The rest of the suspension was painted and detailed and a full CPP 4-wheel disc brake setup, which includes drilled and slotted rotors was added. Lastly, a set of Centerline 22-inch Smoothies were bolted up to really complete the overall look and feel that Dave was after. 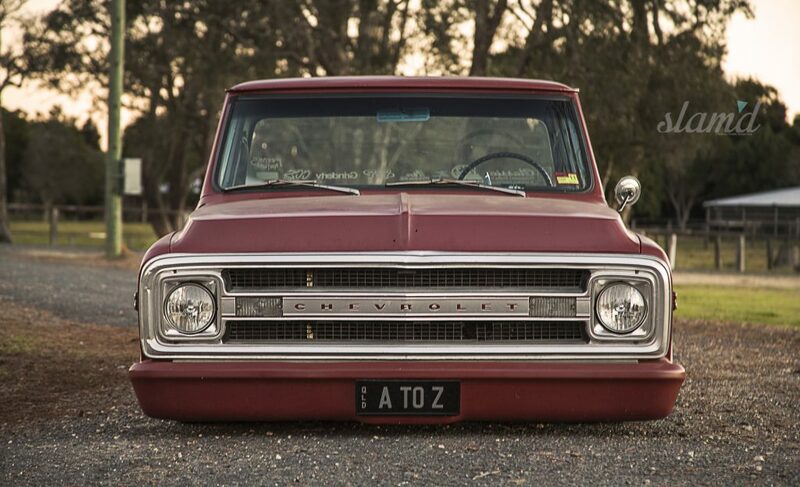 The body mods were completed by A to Z Imports, including the shaved rear side marker lights and emblems. 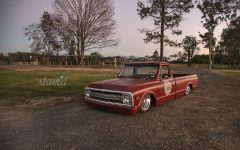 Satisfied with the lines on the pickup they moved their attention to the engine bay, which was also smoothed and shaved. The firewall air box holes and rain drip rails were also removed, luckily this truck won’t be needing any PCI scanning. Wheel tubs were fabricated from sheet metal including rolling the edges using a dolly in a vice. Details such as this may take countless hours for the home builder, but are clearly worth the effort in the end. Additionally, the battery was recessed into the bottom right corner of the radiator support to keep the overall theme of the engine bay super clean. A to Z turned to Valspar for the color they needed and loaded the gun with a Red Oxide Primer, which really adds a super clean touch to the rustic pickup. Dave’s buddy Taco also lent a helping hand sanding on the ’69. 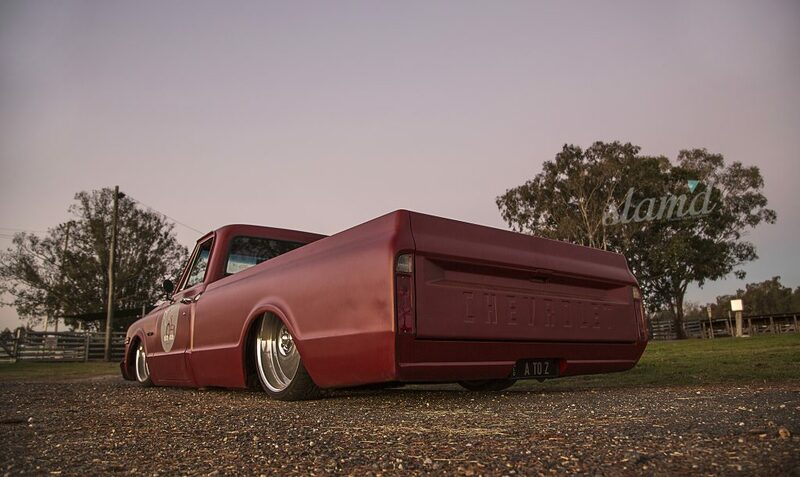 With gloss red paint as the engine bay and interior accent, it helps add that extra touch setting Dave’s C-10 apart from the other full-size trucks in Oz, which are already few and far between. 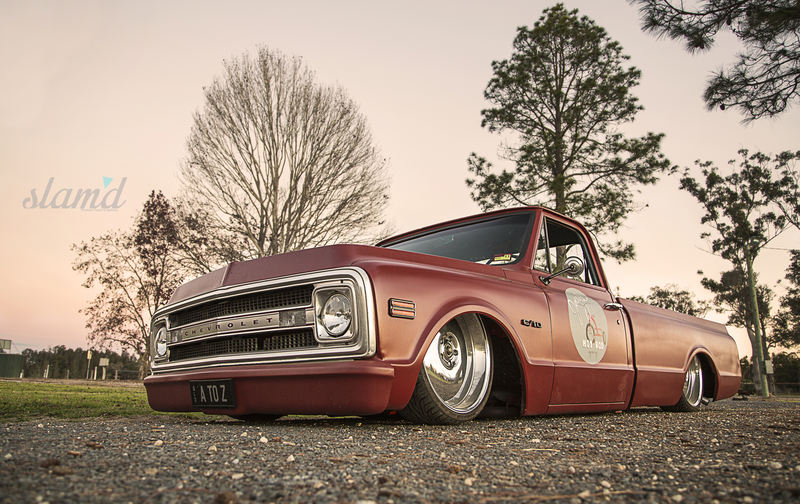 A classic American pickup would not be complete without a solid drivetrain. 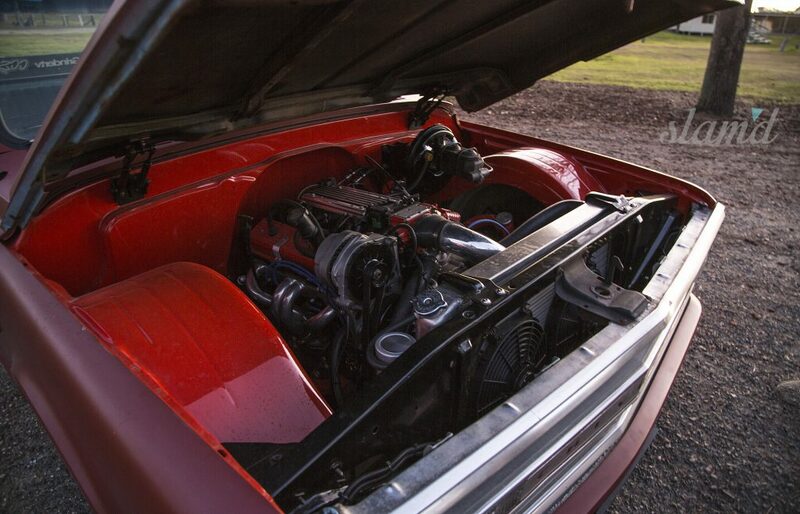 Dave opted for a 5.7L LT1 to keep things clean and reliable. Coupled with a polished alloy piping intake and a set of headers he picked up at the Long Beach swap meet on one of his hunting trips to California for parts. Dave stuck to his guns and was adamant about keeping this truck as a drivable cruiser. After wiring up the motor themselves they built the exhaust and it was time to crank it up and hear it run for the first time. With the engine dialed, it was time to move their efforts inward. 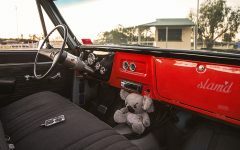 When it came to the confines of the cabin on this Forbidden ’69, the dash really became the centerpiece. 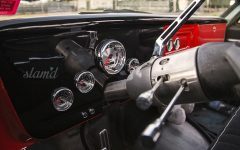 A clean shaving and a new set of Autometer gauges reinforce the clean lines that Chevy set out for 35 years ago. 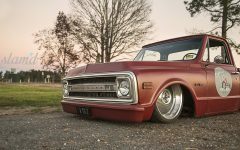 Little details like the glove box lid being cut down and recessed in for a smooth fitment make this classic pickup interior stand out. 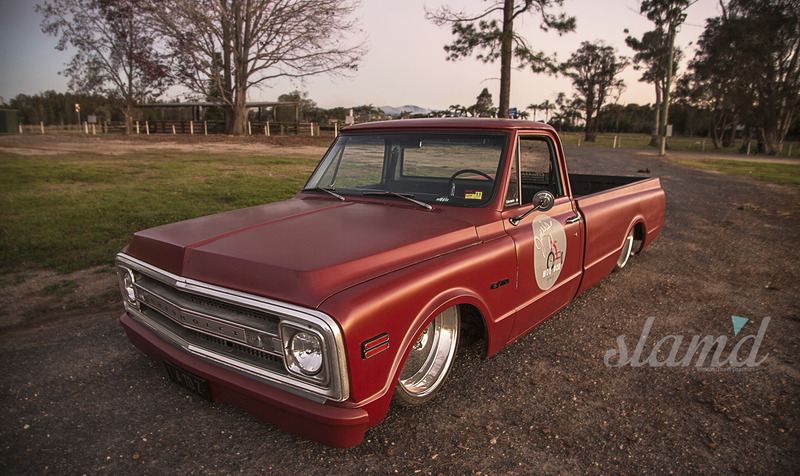 An Alpine head unit and 6×9 speakers in the doors round out the bare essentials for the cab. 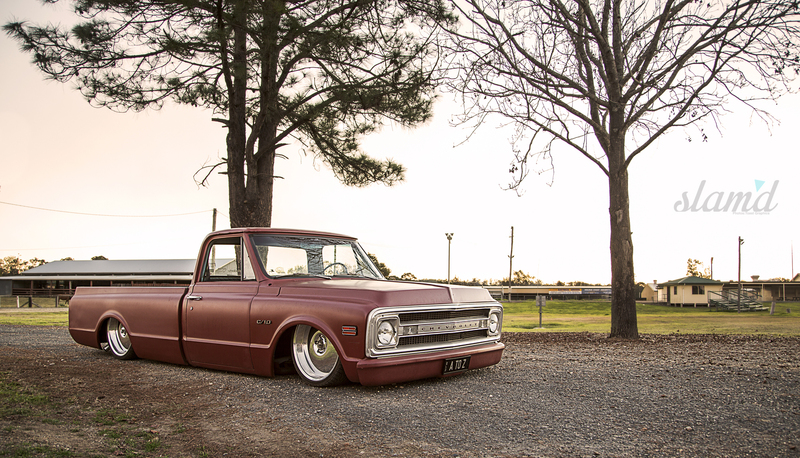 After three short years, and plenty of Australian dollars later, the truck was finally completed. Dave would like to thank his partner in crime Taylor, whom the build would not have been completed without her full support through it all. His boss Robbie at A to Z Imports and all his boys for helping when needed. At the end of the day none of us would be able to accomplish our goals and dreams without the support of those around us. And as Dave shared, make sure keep it Slam’d!